With an extended design, the Ejendals Tegera 595 Thermal Waterproof Gauntlets provide comprehensive protection and comfort for the hands and wrists in harsh outdoor environments. Waterproof and featuring a Thinsulate thermal lining, they have excellent resistance to the elements, and are suitable for a number of applications. The 595 All Round Work Gloves are designated Category II gloves, meaning that they should be suitable for most medium-weight tasks. They are designed specifically for use in cold and wet environments, making them ideal for most winter and outdoor work that doesn't include other hazards. 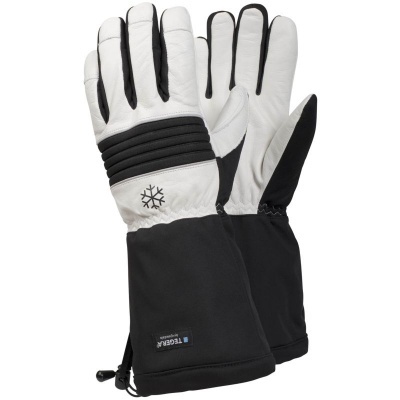 The Tegera 595 Waterproof Work Gloves are available in five different sizes. Please measure the circumference of your hand around the knuckles (excluding the thumb) with your hand open and your fingers together, and the length of your hand from the tip of your middle finger to your wrist. With a palm thickness of between 1.1mm and 1.4mm, the Tegera 595 should have a slightly looser fit than thin precision work gloves. An integrated string lock helps to ensure a secure fit.